Welcome to just another old-fashioned bookstore / wholesale distributor, that has a tinkly little bell when a reader clicked the OPEN sign, which for now might not lead to our previously easy to hack back-door pages. Sorry for any 404 errors you may encounter in your quest for "free books" while we are in recovery from being virus trashed on-line. By who, or is that whom? Anonymous anti First Amendment Internet control freaks that denigrated sixteen years of building a reputation for acting as a small publishers clearing house, dealing with small book retailers. This virtual experience was following the marketing ideas of novelist Stephen King... that he quickly abandoned... when we introduced ourself on-line at the stroke of the Second Millennium, where this page was first uploaded 12:01 2000. What happened that YK2 has brought such changes to the tradition of 500 years of publishing tradition that we are in the process cleaning our shelves from misrepresented "reviews" from an exploding vanity press where self-publishing authors have been tricked into signing away their DMR, or any control of the books digital marketing rights. Go figure! We choose to value our reputation for recommending books that actually dates from Mac&Murray publishing software in 1977 entitled BookMark ... an Apple Hero Award winner... which was a directory that turned down a corner on a recommended read. Yes, a professional reputation really does matter because we had letters from librarians scolding us for suggesting a nasty habit. It also has been written that an honest review from disappearing local newspapers is getting harder, and harder, to obtain.. Nationally, a verified buyer revue system as one finds on Amazon, etc., Apple I-Books, and Barnes & Noble, has become the new standard. Which of course are borrowed by "FREE" reading libraries, that only charge $? per "net citizen" month to join... with absolutely nothing coming back to independent publishers and writers to help pay for fresh manual typewriter ribbons. Yet, with an Edwards Deming TQM, or total quality movement way of looking at business, even the person that spends his precious time reading free or 99¢ books, also needs to fulfilled. This is part of the reasoning for a TQM inspired BannerBooks.com using widespread banners reaching websites that have a demographic readership that matches the content. So, for now, until the CO-OP rebuilds a cyber-safe store behind that real reality wooden door, besides bookmarking us to come back and see what is happening, know that the buttons in the window panes lead to whisper-whisper-whisper pass along directly reading recommendations that matter. The other day I was setting at the kitchen table hunkering down a storm, reading a safe battery powered screen large enough to handle cook books with a mixture of graphics that properly supported the BannerBook.com mission statement that words are pictures / and pictures are thousands of words. Meaning of course that a good printable recipe with illustrations really should not be something easily stolen by a cut and past adaptation, where only the measurement of a single ingredient is changed from a teaspoon, to a tablespoon, to avoid losing a search engine position for being blacklisted for plagiarism. BannerBooks.com is known for being an independent publishers advocate of the fixed page graphic e-books in a down-loadable Adobe Acrobat PDF, formatted to protect copyright protected authors Digital Management Rights from being exploited "for free." Something I know from experience that just happens where the vanity writer is so happy to be "published" he is expected to continue on work away at his kitchen table producing the second something for display on web pages loaded with banners ads selling someone else's brand, that doesn't even pay the author a penny per click. I don't want to give the secrets of Independent publishing away to the MBA accounting wizards of a very changing book industry through an e-book format in conflict with 500 years of tradition of movable type on paper. So just let me say from my 60 plus years as a magazine freelance photographer/writer, and then high-end gloss paper, bleed four-color, magazine publisher/producer, I think traditional 7 x 10 vertical cookbooks need to follow the protocols of periodical publishing where each article, or recipe, meets the standards of the collective title, or 'anthology' if you want to be publishing correct. The point is wasting your bandwidth time, is that book format lovers require a standard of literary quality. As that of many famous authors focused on movable feasts, as Ernest Hemingway's words; and simple descriptions by Lawrence Sanders on how to build a sandwich so juicy it needed to be eaten over a kitchen sink. And also respecting many of the "greats" of story cookbook authors, as Juliette Child, who never saw her total works in competition with Larousse Gasttonomique, really only saw success through marketing outside the established system. Another of my favorite opinionated authors was George Herter of the self-published Bull Cook that went nineteen editions, who really buried a recipe into a copyright protected story, but never achieved his allotted 15-minutes of fame for not being able to escape the established bookstore system, mostly run on a percentage system ... a 10% royalty, if that... to the author. Or authors, prorated by copyright protected pages. Now that the hard costs have changed so drastically through just in time digital printing on drop ship demand, and virtual high-quality white paper replacing pulp, the independent publisher really needs to understand that the stigma of vanity publishers, who offer "Free" help, are very costly when ignoring the self-published "Rich Dad, Poor Dad" advice of maintaining control, really needs an alternative choice of making a living as a writer. I believe it is CO-OP publishing. 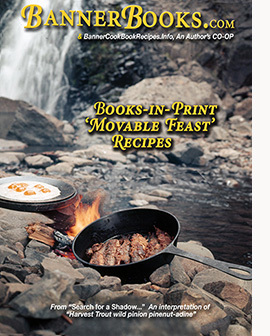 Coming soon from Barry Murray... a gourmet camp cookbook. Click on the dutch oven spider to understand how this CO-OP works. If you have a sample page of a proposed cookbook that could be used for a sales sample then submit it to the CO-OP at www.BannerCookbookRecipes.com. This proposed project requires some extremely well written, researched, and tested intriguing "story recipes" that don't start out with a stereotypical, "My Mother did it this way", to rehash her hash concoction. Which actually may have only been something out of a formula style cookbook... or something so precious for having been worked on for years that is really qualified as a family secret worthy of copyright protection. From my freelance magazine writer / photographer days the protocol for submitting will be outlined in a soon to be published PDF (free for now) BannerCookBookRecipes Writers and Food Photographers guidelines which may be pre-ordered by clicking on the proposed book cover, left, and establishing a non-spam connection to validate who you really are, as required by Copyright Law, which is something all authors need to maintain themselves. My personal "foodie" experience also came through my mother who managed some gifted chiefs, who taught me as a child how to handle and respect a knife. Then as a specialist day rate contributing photographer for San Francisco Magazines Restaurant Reviews, and a "Dining In" column where we often featured cookbook authors in person that I really began to understand ingredient lists and measurements were not a copyrightable. To sell a cookbook you need a wacking good sense of humor story. Copyright © 2000-2017 Mac&Murray, that also may be contacted by clicking the transom above the door. Following the requirements of magazines to have a masthead of how a 'Letter to the Editor' could be delivered toMac&Murray, of macandmurray@gmail.com, which may be reached by snail-mail at Box 678, Waldport, Oregon 97394, where caller ID enabled phone numbers will be answered at 503-753-5868.